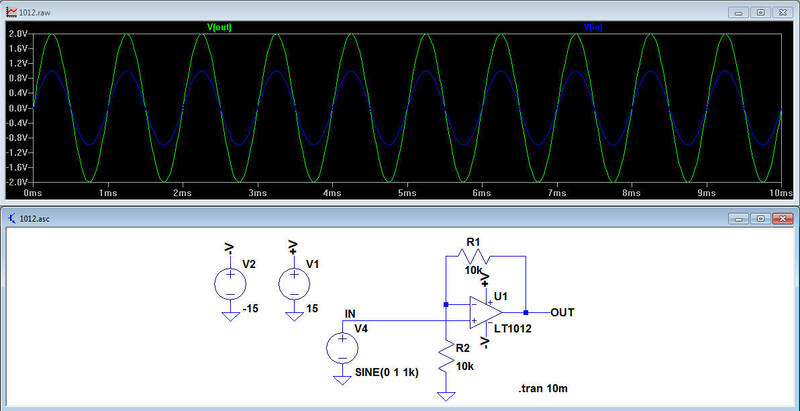 The LTspice Tutorial below will take you through how to get started with LTspice®, the free circuit simulation package from Linear Technology. To download LTspice, go to the Linear Technology Home Page and click on the LTspice Download icon. You can either register to get notifications of updates, or just download the package anyway. If you do not register, you can still update the package as often as you like. Download the .exe file to a directory of your choice. Run the .exe file, accept the license agreement and install LTspice. LTspice should start automatically and place an icon on your desktop. Once in LTspice, click on Tools-> Sync Release to ensure you have the latest updates. It is worth repeating this step every time you use LTspice to ensure you have the latest models loaded. LTspice has models of most of the LTC analogue part numbers as well as 'jigs' to get you started. 'Jigs' are ready made circuits including the desired component and all of the surrounding resistors, capacitors and inductors to enable you to immediately start evaluating it without having to place all the passives. It is advisable to create a separate directory to store your LTspice files so you do not overwrite the original jig files. 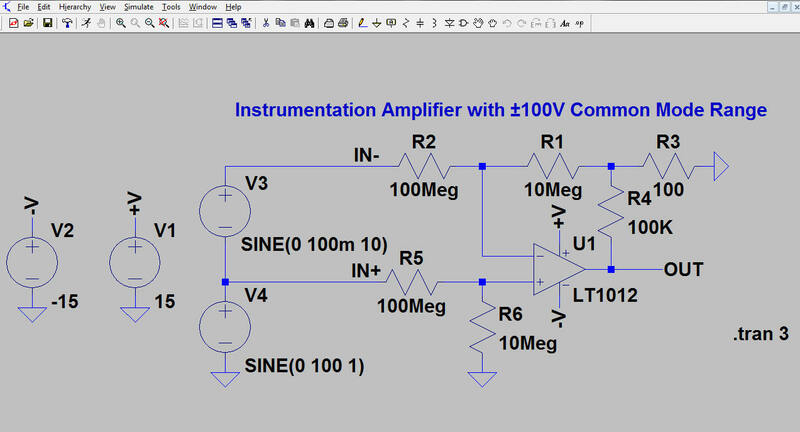 To start, we are going to design a non inverting amplifier with a gain of 10 and a 1kHz 1V sinewave input and a load of 10k Ohms, based on the LT1012 op amp. Double clicking on the desktop icon brings up the page shown in FIG 1. Save this file to your chosen directory. Then save the jig to your chosen directory. To open the datasheet for the part, right click on the part and Select 'Go to Linear website for datasheet'. 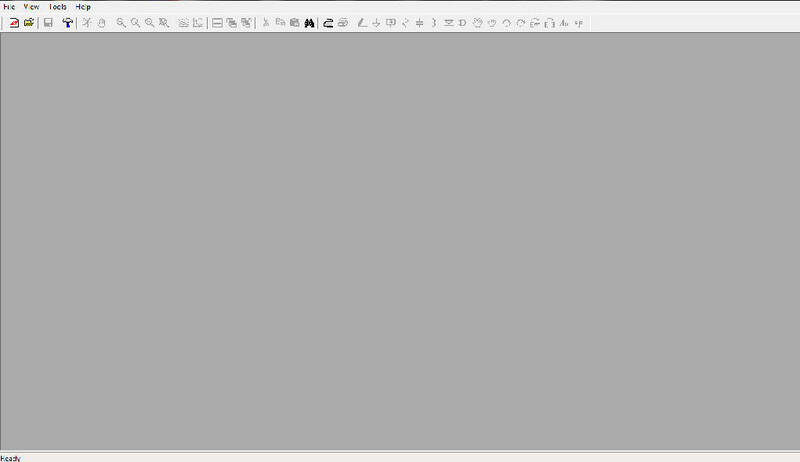 Incidentally, I prefer a white background instead of grey. To change this go to Tools -> Control Panel then click on the Waveforms tab, select Color Scheme, click on the Schematics tab, then next to Select Items choose Background from the drop down menu. You can then move the Red Green and Blue sliders to pick a colour of your choice. We are going to edit this schematic to get a non inverting amplifier as specified earlier. In the schematic above, V1 and V2 are the +/-15V supply to the LT1012, so we will keep these. We also want to keep V4, the input signal as well as the op amp. 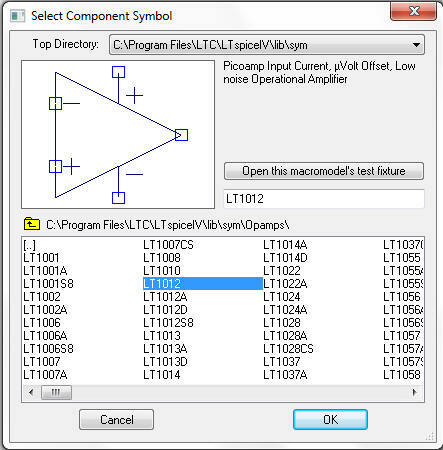 Using the shortcut keys and the toolbar construct the schematic shown in FIG 4. It is worth noting that large areas of circuit can be deleted/moved/copied by selecting the appropriate <F> key, holding down the left hand mouse button and highlighting that part of the circuit. Note that R1 and R2 are generic resistors with no value. To change the value of any component in LTspice, right click over the component to bring up the basic component properties. Holding down the <CTRL> key and right clicking brings up a more comprehensive list of properties. To change the values of R1 and R2, right click over these components and type 10k into the Resistance box. 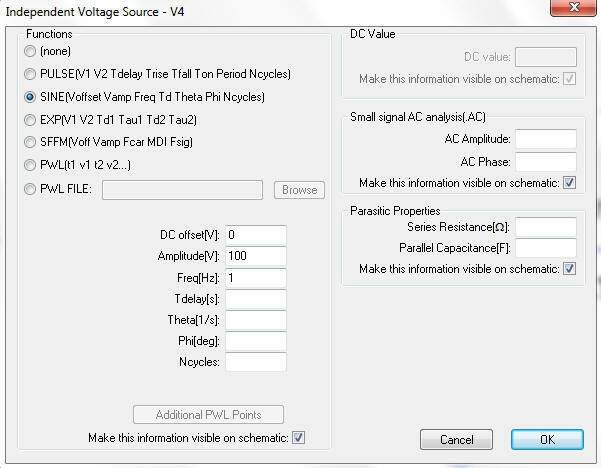 This dialogue box allows us to choose whether V4 is a dc voltage, Pulse, Sinewave, Exponential, Single Frequency FM or Piece Wise Linear waveform. The only parameters we need to modify are Amplitude (change this to 1) and Freq (change this to 1k). Incidentally, LTspice recognises 'M' to mean 'milli' so setting the frequency to 1M will produce a sinewave of 1milliHertz. If a frequency of 1MHz is desired, either use 1000k or 1MEG. Click OK to return to the schematic. We are now ready to simulate the circuit. Save the file first. The screen will divide showing the schematic in one half and the simulation window in the other. Click the mouse anywhere in the schematic window. Moving the mouse over certain parts of the circuit will highlight either a voltage probe or current probe. All circuits must have a ground. Drawing a wire straight through several components is an easy way of connecting the components in series. If you need to plot a differential voltage, move the mouse to the positive node of the voltage to be measured and once the probe symbol has appeared, left click the mouse then drag the probe to the negative node. The probe colour will change from red to black. Release the mouse and the differential voltage will be displayed. Select 'Mark Reference'. Thereafter all plots will be referenced with respect to that node. Sometimes it is convenient to have 2 plot panes, especially when comparing 2 voltages of very different amplitudes. To create multiple plot panes, move the mouse to the plot pane, right click and select Add Plot Pane. Left clicking on a specific pane loads the probe results into that pane. Left clicking on the waveform icon (eg V(out)) and dragging the icon to the other pane, moves the waveform to the other pane. To remove a waveform from the plot pane, hit the <F5> key and delete the appropriate waveform logo at the top of the plot pane. As with the schematic editor, the <F9> key undoes the last action performed in the plot pane. Holding down the ALT key and left clicking over a wire plots the current in the wire. Holding down the ALT key and left clicking over a components displays the instantaneous power in that component. The latest version of LTspice (LTspice XVII) allows the use of multiple monitors, so the schematic can be displayed on one monitor, while the plot results are displayed on a second monitor. Right click in the Schematic Window and select 'Float Window'. The Schematic Window can now be moved between screens. The same can be done with the Plot Window. The toolbar can, however, only address non floating windows, so the Running Man symbol is greyed out when windows are floating. 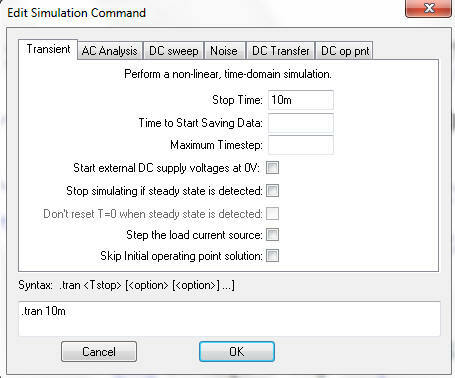 To run the simulation, select the Schematic Window, right click then select 'Run'.